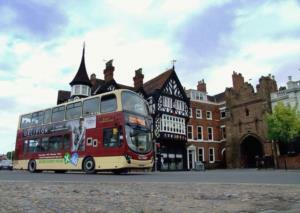 From Sunday 24 May Beverley buses will be getting better. New bus from North Molescroft/Butterfly Meadows & Woodhall Way/Copandale Road to Hull! Find out more. New bus route past Flemingate, Beckside and Beverley Parklands! Find out more. Buses from Beverley to Hull will now run every 15 minutes during the day! Find out more. New extra bus stop in Hull City Centre for buses from Beverley! Find out more. New times for Services 121, 246 & X46. Find out more. Our brand new Service 122 will connect North Molescroft/Butterfly Meadows and St Leonard's Road/Woodhall Way/Copandale Road to Hull. Buses will run hourly during the day, so you can easily get to Hull without having to change buses. This will replace Beverley Town Service 523. See the new Service 122 timetable. Service 246 will have a new route in Beverley. It will come in from Hornsea via Hull Bridge Road/Norwood as usual, stopping at Beverley Bus Station. Buses will then go via New Walkergate, Armstrong Way, past the new Flemingate Retail Park and East Riding College site, along Flemingate and then on to Hull via Woodmansey and Dunswell. This means residents from the Flemingate/Beckside/Beverley Parklands area can get to Hull more easily. See how the new Service 246 fits in with other Beverley Buses, and see a map of the new route, on our Beverley to Hull Buses leaflet, or see the full Service 246 timetable on our new Hornsea to Hull Buses leaflet. Buses from Beverley to Hull now every 15 minutes! There will now be four services connecting Beverley and Hull. During the day Beverley will have buses to Hull leaving the Bus Station every 15 minutes, meaning you'll never have to wait long for your next bus. See the new Beverley to Hull Buses leaflet. New bus stop in Hull City Centre! Buses from Hull will now stop in three different places in the city centre - the current stop near Debenhams, a new stop outside Primark/Princes Quay and then Hull Interchange. This means you can get off the bus right in the heart of Hull's shopping district. To help us make all the improvements we've explained above, there will be changes to the times of Beverley bus services. Service 246 will have a new route in Beverley (see above), and to make your journey quicker Service 121 will now no longer go into the Beverley Community Hospital site but will stop at a nearby stop on Swinemoor Lane. See the new Service 121 timetable. See the new Service 246 timetable. See the new Service X46 timetable. Or see how all the services work together in our Beverley to Hull Buses leaflet. We'll be in Saturday Market in Beverley with our lovely vintage Beverley Bar Bus on Saturday 16 May and Wednesday 20 May, 10am-3pm. Come along to see us, ask questions about the new services, pick up timetables and discount vouchers and have a look around our bus. Can't make the events? Don't worry, you can download your timetables from this website, pick up a copy from Beverley Tourist Information, Beverley Library or Beverley Bus Station, or ring BusLine on 01482 59 29 29. Most Beverley residents will also be getting the new timetable, including a couple of money-saving vouchers, through their door in the next couple of weeks, so look out for it.